Small Biosystems Lab, Departament de Fisica Fonamental, Facultat de Fisica, Universitat de Barcelona, Spain. Ciber BBN de Bioingenieria, Biomateriales y nanomedicina, Instituto de Sanidad Carlos III, Madrid, Spain. The second law of thermodynamics pervades the natural world. Using a non-specialized jargon we may say that systems (and the universe as a whole) tend to become unstructured and disordered by the sole action of the naturally occurring physical forces. From Clausius to Boltzmann the second law of thermodynamics has emerged around the concept of entropy. Entropy is a quantity that characterizes the thermodynamic state of a system and quantifies the degree of usefulness of its energy content. The combination of energy and entropy gives the free energy, a thermodynamic state function that determines, in concert with the second law, the natural fate of thermodynamic transformations. A useful formulation of the second law states that for any irreversible transformation of a system kept in contact with a thermal bath, the amount of work performed on the system by an external agent is greater or equal to the free energy difference between the initial and final states. In other words, any thermodynamic transformation requires the expenditure of a minimum amount of work typical of reversible or quasi-static (i.e. slow enough) transformations. Faster transformations always require larger amounts of work incurring in finite amounts of energy that are dissipated to the environment. Such transformations are generally called irreversible: the larger the amount of work, the more the process is irreversible. The second law stands amongst the most fundamental laws of nature, yet some hiss around it has started to emerge over the past years. That hiss -- already known to Boltzmann, Smoluchowski, Schroedinger and others -- is now experimentally accessible. Indeed, the second law inequality has to be understood in terms of averages. For very small systems (often called mesoscopic) or enough short times some realizations of the irreversible transformation transiently violate the second law, whereas others (the vast majority) preserve it. Such variability stems for the thermal or Brownian forces in the environment that produce noise and fluctuations in the dynamical evolution of the system. Every time the same experiment is repeated a different outcome for the actual performed work is observed. Only by averaging over many (actually infinite) repetitions of the same transformation, the second law inequality is preserved. Over the past years a series of remarkable results that go under the generic name of fluctuation theorems have shown that such hiss around the second law can be used to recover free energy differences during irreversible transformations (for a review see ). This is unexpected: the second law -- being mathematically expressed as an inequality -- does not provide a clue about how to extract free energy differences in irreversible transformations. 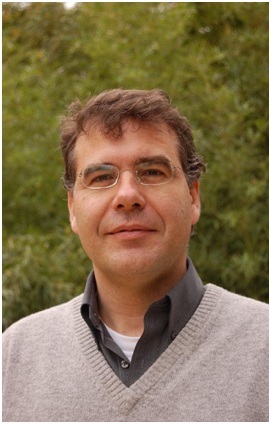 In 1997 Chris Jarzynski derived a beautiful equality that shows how free energy differences can be recovered from repeated work measurements along irreversible processes . A few years later Gavin Crooks extended Jarzynski’s results and proved a fluctuation relation by considering a thermodynamic process and its time reversal . Fluctuation theorems provide an elegant way to extract free energy differences by repeating the same experiment many times back and forth. Single molecule manipulation offers excellent opportunities for exploring such theoretical predictions. One can use AFM (Atomic Force Microscope), magnetic tweezers or optical tweezers to repeatedly pull back and forth a folded biomolecule (e.g. a nucleic acid hairpin or a protein) to unfold the native structure and refold the unfolded structure many times. In 2005 the first experimental test of the fluctuation theorem by Crooks and the measurement of free energy of folded RNA native structures from irreversible mechanical experiments were carried out . Since then and until recently all applications of fluctuation theorems to recover free energy differences only considered native states. However, much less known but equally relevant in biophysics are kinetic states, i.e. states that are metastable in the thermodynamics sense (i.e. they have free energies that are higher than the lowest free energy of the native state). The paper recently published in Nature Physics by Anna Alemany et al. 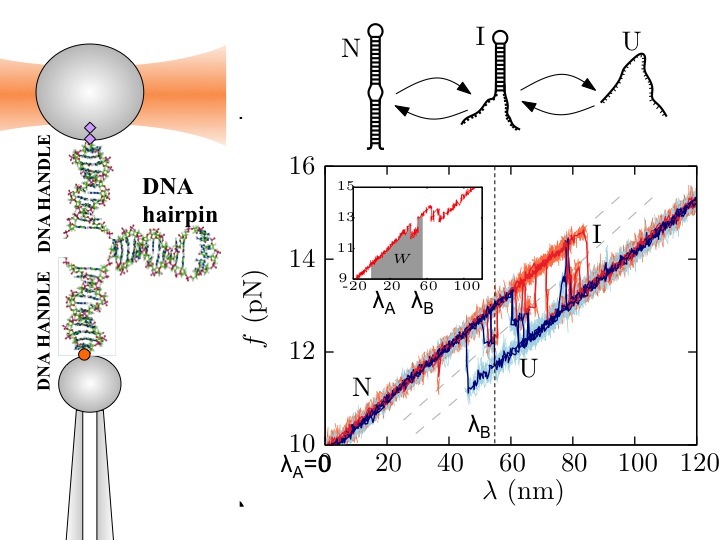 addresses the recovery of free energy of kinetic states in DNA molecular structures from irreversible pulling experiments with optical tweezers. Figure 1. Illustration of the transformation between two sets containing partially equilibrated states. Configurations inside each colored phase-space region are sampled according to the Boltzmann factor. In contrast, the statistical weight of the regions is not determined by its equilibrium free energy. λ(t) denotes the pulling protocol in the experiments, whereas A,B,C stand for any native or kinetic (intermediate or misfolded) state. We apply an extended version of the fluctuation relation originally introduced by our group in 2010 to recover free energy branches . In a nutshell such extended version requires that the initial state during the thermodynamic transformation be partially (rather than globally) equilibrated (Figure 1). Physically this means that the system is locally equilibrated in one or more metastable states for a finite time. The application of the extended relation then follows the same route as the standard Crooks relation. The new feature is that the different unfolding and folding trajectories must be classified into different sets -- based upon which state they start and end with; and the fraction of trajectories belonging to each set together with the partial work distributions for each set must be measured accordingly. We applied the extended relation to DNA structures exhibiting kinetic intermediates and misfolded structures (Figure 2). In all cases we showed that the extended fluctuation relation provides free energy estimates of the different kinetic states even in cases where equilibrium methods are not applicable (i.e. when full equilibrium cannot be reached in the experimentally accessible timescales). Figure 2. Pulling experiment. (Left panel) Schematics of the pulling experiment with optical tweezers. The bead captured in the optical trap (red colored region) is used to measure the force acting on the molecular construct (hairpin plus handles). The position of the trap relative to the bead in the pipette defines the control parameter λ in the experiment. (Right panels) Force-distance curves. The extended fluctuation relation paves the way to future free energy measurements of short-lived or inaccessible states that are not affordable with other bulk techniques. Applications are abound in RNA, proteins, DNA-protein, DNA-peptide, protein-protein systems. It is remarkable that that hiss around the second law finally turned out to be so useful for the measurements of pure thermodynamic quantities. Felix Ritort, "Nonequilibrium fluctuations in small systems: from physics to biology", Advances in Chemical Physics, 137, 31-123 (2008). Abstract. C. Jarzynski, "Nonequilibrium equality for free energy differences", Physical Review Letters, 78, 2690–2693 (1997). Abstract. G. E. Crooks, "Path-ensemble averages in systems driven far from equilibrium", Physical Review E 61, 2361–2366 (2000). Abstract. D. Collin, F. Ritort, C. Jarzynski, S. B. Smith, I. Tinoco, Jr and C. Bustamante, "Verification of the Crooks fluctuation theorem and recovery of RNA folding free energies", Nature, 437, 231–234 (2005). Abstract. Anna Alemany, Alessandro Mossa, Ivan Junier, Felix Ritort, "Experimental free-energy measurements of kinetic molecular states using fluctuation theorems", Nature Physics, 8, 688–694 (2012). Abstract. Ivan Junier, Alessandro Mossa, Maria Manosas, Felix Ritort, "Recovery of free energy branches in single molecule experiments", Physical Review Letters, 102, 070602 (2009). Abstract.